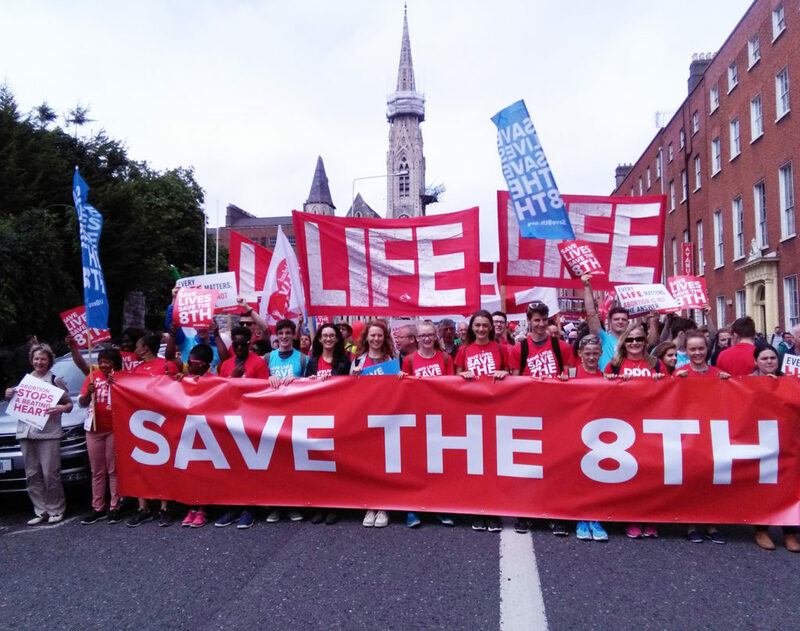 Pro-life activists have described the massive Save the 8th Rally for Life which took place in Dublin today as ‘the real Citizens Assembly’ and vowed that the tens of thousands who marched today would work ‘night and day’ to ensure the 8th amendment would be saved. “This is an incredible, powerful day, when massive crowds of ordinary people turned out to Save the 8th, to say no to abortion and yes to Life, to tell Leo Varadkar that he would lose this referendum on abortion, because the pro-life majority has arisen and will work night and day to Save the 8th,” said Niamh Uí Bhriain of the Life Institute. “We were expecting 50,000 but as the Rally moved through Dublin City, up to 80,000 people brought the city to a standstill as they joined in to Save the 8th. “This is the real Citizens Assembly, this is the real voice of the Irish people, and we are here to tell Mr Varadkar that he will lose referendum he is so eagerly pushing, because we, the people, have arisen to Save the 8th, and we, the people, demand a better answer than abortion for our mothers and babies,” she said to prolonged applause. Sovereignty campaigner, Declan Ganley told the crowd that “there is not one thing in this world that is made better by the snuffing out of an unborn child. There is no woman whose life is the better for it. There is no community made stronger by it. There is only death, and a void where hope might have been.” He urged those attending the Rally to get involved in the campaign and make a stand for life, to sustained applause. The loudest cheers of the day were for Karen Gaffney, a leading international advocate for people with Down Syndrome who urged the crowd to Save the 8th to protect the right to life of “people like me”, and warned that in other countries, aggressive screening programs meant that up to 100% of people with Down Syndrome were being aborted. “We want to belong, don’t screen us out,” she said. Other speakers included Carolyn O’Meara of Giannacare, Bernadette Smyth of Precious Life, Becky Kealy of Youth Defence and Isabel Vaughen Spruce of March for Life UK. Niamh Uí Bhriain said that grassroots activists right across the country had been mobilised by the government’s decision to hold a referendum to repeal the right to life of preborn children.